As if the frustrations of air travel weren't bad enough, airports have restrictions on how much liquid you can take with you through their security checkpoints and onto airplanes. Of course, this is for everyone's safety as liquid explosives pose a serious threat to aircraft carriers. Here's the good news, though. However annoyed you are that you have to toss your Poland Spring 16-ouncer, your breast milk is good to go. Different countries have different regulations when it comes to how much breast milk you can bring with you when you travel on an airplane. United States: In the US, the Transportation Security Administration (TSA) is responsible for screening passengers and bags at the airport. Typically, the TSA allows you to carry liquids in your carry-on baggage if they're in containers that are 3.4 ounces (100 ml) or less, and all the containers fit into one see-through quart-sized zipper bag. However, the liquid rule is a bit different when it comes to feeding infants and children. This is the category that breast milk falls into. Moms who are flying (with or without) their child can bring breast milk in quantities greater than 3.4 ounces or 100 milliliters onto the plane in their carry-on as long as they declare it for inspection at the security checkpoint. The TSA Security Officers will examine your containers. They also have the right to test all liquids for explosives. But, even though security will inspect your breast milk, they will not ask you or your child to taste it. Other Countries: In the United Kingdom, you can also travel on an airplane with breast milk in your hand luggage. Depending on the length of your flight and the age of your child, you will most likely need more than 100 milliliters and a quart-sized bag worth of bottles. That's OK. You can bring what you need, but each container cannot hold more than 2000 MLS. You may also take liquid breast milk in your hand luggage if your child is not with you. However, if you have frozen breast milk, you will have to place it in your checked or hold luggage. Other European countries have similar restrictions. To avoid confusion and problems at the airport, check the screening process for the airport you will be using before you travel. Separate your breast milk from all the other liquids, gels, and aerosols in your carry-on bag. Tell the security officer at the security checkpoint that you have breast milk to carry on to the airplane. Once you reach the X-ray machine, have your breast milk out and ready for additional inspection. The FDA has stated that foods or medications that have been through the X-ray machine are not harmful. If you're in the US, containers of frozen milk may be checked by just looking at them. Fresh, thawed, or slushy milk may be subject to further examination. You may be asked to open the container of breast milk and pour some out to test for explosives. If the security officer must touch the breast milk bottles, you can request that he or she put on a clean pair of gloves. 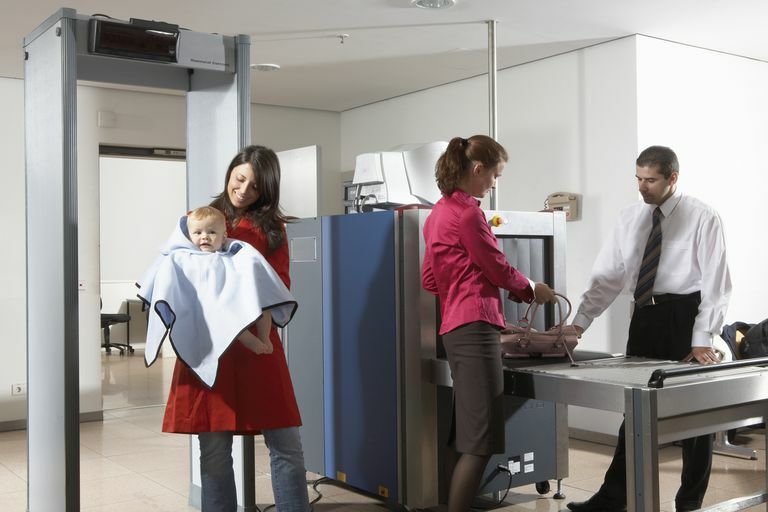 If you do not want your breast milk to be opened or put through the X-ray machine, let security know. The TSA will have to clear the liquid, you, and your traveling party through other screening methods. You should try to bring only as much breast milk in your carry-on that you will need to reach your destination. Try to avoid packing a lot of extra bottles in your carry-on. If you need to pack your breast milk in a small cooler with ice packs or frozen gel freezer packs, these items are allowed when traveling in the US. Keep in mind that frozen and partially frozen breast milk will also go through the screening process. A small cooler for your breast milk should not count as an extra bag when boarding the plane. In addition to breast milk, you can also bring baby food, juice, and infant formula along on your journey in a carry-on bag or diaper bag. Of course, all of these items are subject to the same screening. When packing your carry-on bag, you should bring the amount of breast milk and formula that you will need for the duration of your flight and the time you'll spend waiting at the airport. It's understandable to take a little extra because it's always wise to plan for a delay. However, you probably do not need a week's worth of breast milk for a day at the airport. So, any additional breast milk or formula can be packed in your checked baggage or hold luggage. If you're traveling outside the US, you should also pack frozen breast milk in your hold luggage and check it at the airport. Hand luggage restrictions at UK airports. Baby food and baby milk. GOV.UK. Transportation Security Administration. Traveling With Children. Formula, Breast Milk, and Juice. U.S. Department of Homeland Security.